The Rueben Burger is the St. Patty's Day special! It is one of their classic thick cut burgers cooked to your preference and topped with a traditional St Patty's Day spread. That spread includes corned beef, sauerkraut, swiss cheese, and of course a 1000 island dressing. 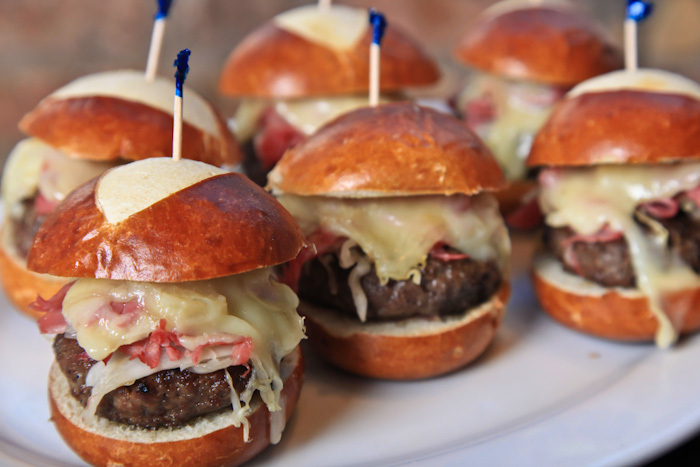 It is served on a pretzel bun and yours to enjoy. Also check out their Shamrock Milkshake and their drink specials that include green beer, irish car bombs, and everyone's favorite... Jameson. I know I am excited. With so many burger places popping up around Chicago, Rockit Burger Bar in the Lakeview/Wrigleyville area has plenty of competition. This restaurant also offers high quality burgers with some outrageous toppings. However, unlike the other places I have been to (like 25 degrees or The Burger Point), they offer seasonal specials which take advantage of current trends and keeps everyone's tastebuds at bay. From a Jingle Bell themed burger to now a St Patty's Day special, I always look forward to what will come next. Anyway, when concerning the food, the portion size is great and the average cost of the burger is perfect for students. The waitresses are friendly, even inside the dimly lit dining area, which I wasn't a huge fan of. Personally, I enjoy a generous helping of toppings on my burger... so maybe a little bit extra would be nice. Anyway, check back at this post for future updates on their seasonal specials (see above)! After hearing Rockit Burger Bar was offering a holiday themed burger, one of my friends and I decided to give it a try. The Jingle Bell Rockit Burger is different from their typical angus beef burger mainly because it is a half pound grilled venison patty (in this case, deer) topped with caramelized onions, a bourbon cherry jam, and a foie-nut-butter. It was all served on toasted bun (with a whole wheat bun as an alternate option). I decided to get mine cooked medium rare with my friend choosing the medium cooking temperature. I had to keep in mind that venison is much leaner than the typical beef patty, so a little drier patty is understandable. In my case, the medium rare was a good option, but I wasn't sure if it was a little overcooked or just the lack of fat that made it a little dry. Luckily, however, the amazing jam and foie-nut-butter made gave that sauciness that I was looking for. These toppings sort of reminded us of a peanut butter and jelly sandwich (which may sound weird), but trust me... it was delicious. Both of us did wish there were more of the grilled onions to give it that sharpness that was missing. Overall, I really enjoyed the burger and would definitely recommend everyone to come try it while they have it as their special. Each burger comes with either regular fries, sweet potato fries (for an additional $2), waffle fries (for a buck more), or truffle fries (for $2 more). We both had sweet potato fries with ours which is an excellent side. A huge pile of these sweet potato fries were dusted with a brown sugar / salt mixture which gave a perfect balance of sweet and salty. They are served with a chipotle mayo which was great at first, but became a little too rich and not enough spice after a few bites. Maybe something a little spicier or lighter would help cut some of the greasiness of the meal. This was a huge surprise. For the holidays, they were offering an alcoholic eggnog milkshake. These were great... possibly the best part of dinner. Served in a mason jar with a handle, these thick milkshakes were topped with whipped cream and a cherry. The rum flavor definitely was present and the it honestly tasted like classic eggnog. It seems impossible to get a buzz from an alcoholic milkshake, mainly because it takes so long to drink. But still, I highly recommend these milkshakes and am anxious to get back to Rockit to try the others they offer. - Definitely check out their specials. I really enjoy the rotating burger so every time you come here there is always something new to try. - Milkshakes are incredible so I highly recommend try them. You will not be disappointed. - During some sporting event, this place would be a great bar to watch the game with some buddies. - I would stick with more of the simple sides... either regular or sweet potato fries. I am not a huge of truffle fries, and I haven't had them at Rockit, but overall experiences have caused me to pass most of the time. Let me know what you think! I really enjoyed their burgers and the creativity of their menu. I will definitely be back to try more!